Event-triggered emails typically generate a huge return on investment because once they are set up, they run automatically and don't require a lot of on-going work. 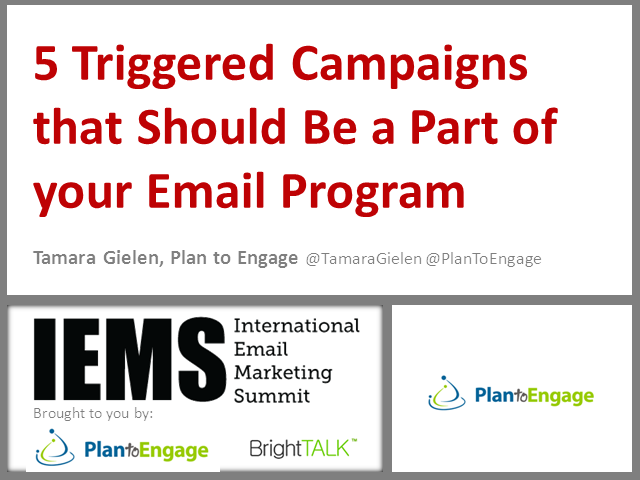 In this session, Tamara will discuss the five most important event-triggered email campaigns you need to implement. Join Kath Pay of Holistic Email Marketing and Bram Smits of Tripolis as they cover the state of play in email vendor use and satisfaction among email marketers around the world. •Whether business strategy factors into technology decision-making – if at all. Download your free copy of Email Marketing Vendor Satisfaction in advance and join the discussion with your own questions and comments. Reserve your spot today! If you can't attend the live discussion, don't worry – we'll send you a link to the recorded version. Customer Experience Email Marketing (CX Email Marketing) is a balanced approach to email marketing in which brands achieve their goals and objectives by helping customers achieve theirs. It shouldn't be a radical notion, but a quick glance through the inbox will reveal message after message fails to ask one simple question: "How can we help you today?" Trying to grow your email list? No matter what you are doing to get the attention of your prospects, in the end, it all comes down to your email address capture form… is it performing as well as it could? Volunteer your form for critique. Kath and Austin will provide you with live analysis and constructive suggestions on how to immediately improve the quantity and quality of the email addresses you are capturing. They'll also talk through best practices, target metrics, error messages, confirmation pages, and more! All attendees will leave with great takeaways to immediately improve the quantity and quality of email addresses they are capturing. Kath Pay, founder of Holistic Email Marketing - Kath lives and breathes email marketing, with over 18 years email marketing experience, and 10 years on the UK DMA Email Marketing Council, she is regarded as an industry thought leader. Kath is a leading email marketing speaker and trainer and recognised as a top international email marketing thought leader. Komal Helyer, Head of Marketing at Pure360 With over 18 years of email and digital experience, Komal has a deep understanding of marketing strategy, a marketer's needs and how that translates into the use of marketing technology. She leads the Pure360 marketing team with a focus on market positioning, market growth strategies and customer lifecycle marketing. Join Kath Pay of Holistic Email Marketing, and esteemed marketing industry analyst David Daniels, as he shares new research, tactics and strategies to improve the customer experience and relevance. David will review several new innovations and technologies and discuss their effectiveness. David will also take your questions and offer access to research reports available for download. As CEO of The Relevancy Group, David directs market research and advisory services essential to digital marketing. Direct Magazine said David is “one of the most influential experts in email marketing, if not the most influential.” Co-author of ‘Email Marketing An Hour A Day’, David has held senior level positions at Forrester, JupiterResearch, Apple, Anthropologie and other top brands. In 2017 David was named Email Marketer Thought Leader of the Year by the eec/DMA. David is also the Publisher and Founder of The Marketer Quarterly a digital magazine for marketers by marketers available for free with registration at www.marketerquarterly.com or via the MQ App on Apple, Google and Amazon. - What are the new challenges with gaining consent for new and existing data. With over a decade’s experience, Steve is a data protection and email deliverability specialist and is an expert on the impact of the GDPR to the email marketing industry. Steve has worked with the DMA since 2012 and was elected to the DMA Email Council in 2015. Steve belongs to the CIPP/E (Certified Institute of Privacy Professionals – Europe), the CIPT (Certified Institute of Privacy Technologists) and was recently awarded the IAPP Fellow of Information Privacy. Personalisation is the latest trend within email marketing and with good reason - it delivers the goods. However, the reason behind its success is not what you may think. In this must-attend session, Kath Pay, CEO of Holistic Email Marketing de-mystifies personalisation and reveals that contrary to popular opinion, personalisation should not in fact be our objective, but instead it should be to deliver a great customer experience using personalisation as a strategy to achieve this. This session will be packed full of practical tips and advice on not only how to achieve a better customer experience using personalisation, but will also demonstrate as to why it's so powerful. Beware though - you may well be pleasantly surprised at the many ways to achieve personalised emails beyond product recommendations! Successful ecommerce marketing is all about being engaging - saying the right thing (or offering the right product) to the right customer at the right time. Engaging your prospects and customers with relevant copy, personalised offers and targeting them at the right stage within the lifecycle, means that you’ll not only achieve great results, but you’ll have your customer coming back time and time again. Kath lives and breathes email marketing. As Founder of Holistic Email Marketing, she devotes her time to developlng customer-centric ecommerce journeys using a holistic, multi-channel approach. Kath is recognised as one of the UK’s leading Email Marketers and heads up training for Econsultancy on Email Marketing. Some of the retail and B2C brands she has either trained or helped are: Ebay, Mr Porter, Bally, Barbour, Paul Smith, Ocado, EE, Dyson, Marks and Spencer, Wallis, Schuh, Co-operative Group, Argos, Next, Asda, Jaeger, Mont Blanc, Expedia, Net-a-Porter, Secret Escapes, George, Dixons, Bookatable, ShopRush, Adobe, Facebook, VisitScotland – just to name a few. In the B2B world, aligning sales and marketing has been a challenge going back decades. If you believe the stereotype, it's because marketing is the colouring-in department and sales are know-it-alls who don’t listen. This session will look at how to align the two when adopting an Account Based Marketing strategy. Call-To-Action (CTA) is all too often an after-thought. This webinar reveals the secrets to creating CTA's that encourage the action you’re after – whether it’s downloads, sign-up’s or sales. ​A CTA can fulfil many different purposes as part of the customer experience on your website, in your email communications, banner ads, ppc ads and more. There is an art to integrating them in a way that encourages action and provides your customers with the additional benefit of a positive customer experience. This is an extremely practical webinar aimed and e-Commerce and digital marketing professionals looking to improve online conversion. You create and send regular emails to your database as part of your marketing channel mix. You no doubt run tests on what works best to improve your email marketing. But do you use your emails to test hypotheses that could inform and improve your other channels - such as PPC ads, website copy and page design, banner ads - to improve engagement and conversion rates? Aimed at marketing professionals looking to push the power of their email marketing, this FREE webinar reveals how to leverage the testing ability of your emails to improve the performance of your other marketing acquisition and conversion channels. ​Your email database contains the valuable opinion of prospects and customers already engaged in your brand. This webinar will be packed full of practical tips and advice on how to use your email channel as a testing ground to derive useful insights. Need more conversions from your email marketing? The best place to start is with your email Subject Line. Many of us wait until we're ready to press send, before we hastily throw together an ill-considered subject line. Aimed at e-Commerce and marketing professionals, attend this webinar to learn many invaluable tips that will revolutionise how you write subject lines. Learn the secret to writing subject lines that not only grab your customers attention, but also increase online conversions. Join Kath Pay, Marketing Director of cloud.IQ, on this webinar to discover how you can use popovers (also known as lightboxes or overlays) to increase your conversions - whether you are looking to drive sales, subscribers, return visits or downloads. Take the right approach to popovers and they can be an extremely effective conversion tool that are also a helpful customer service tool, encouraging loyalty. Companies looking to increase their subscriptions and download conversions have seen a 300 - 400% uplift. A Call-To-Action (CTA) is all too often an after-thought. This webinar reveals the secrets to creating CTA's that encourage the action you’re after – whether it’s downloads, sign-up’s or sales. A CTA can fulfil many different purposes as part of the customer experience on your website, in your email communications, banner ads, ppc ads and more. There is an art to integrating them in a way that encourages action and provides your customers with the additional benefit of a positive customer experience. What motivates your customers to buy from you? If you’re still trying to figure it out, watch this webinar to discover how you can leverage human nature and basic psychology to drive conversions. Hosted by Kath Pay, Marketing Director of cloud.IQ, this webinar reveals how you can use copy, design and persuasive techniques to trigger positive, often subconscious responses that are innate within all of us, to encourage action. By leveraging human traits that are present within us all, you can apply techniques that tap in to each persona and their specific buying habits. We will also look at how different personalities use the web and how you can shape your site experience to encourage engagement and action. Email Marketing is powerful and marketing automation is even more so - especially when applied to a customer-centric lifecycle marketing programme. Join Kath Pay of Plan to Engage, in this webinar to discover how you can benefit from implementing these 7 lifecycle programs. Be prepared to be informed, inspired and engaged. Not only is Abandoned Shopping Cart recovery an art but happily 85% of abandoners are open to receiving cart reminders. in fact, 35% of shoppers who abandon carts actively welcome receiving these emails. Join Kath Pay of Plan to Engage & abandonment expert, James Critchley of cloud.IQ and not only find out why this is a fantastic opportunity to increase your revenue but also what you can do to increase your conversions and revenue. Part 2 of a 2-part series. Is your email marketing as profitable as you’d like it to be? If not, join Jeanne Jennings, as we take a forensic approach to analyzing past results – and figuring out what qualitative changes to test to boost bottom line performance. You’ll learn how to use a revenue tree analysis to identify areas of strength and places with potential for improvement in your program. Then we’ll utilize other advanced analytics tools and show examples of how you translate quantitative data into qualitative changes to boost your results. Whether you’re a spreadsheet guru or numbers-challenged, you’ll enjoy this session (it won’t be dry, I promise!) and gain a deeper understanding of how to use data to improve your email marketing efforts. How often have you abandoned a checkout due to a confusing and difficult experience? Unfortunately this is more common than it should be. Join Kath Pay of Plan to Engage and James Critchley of cloud.IQ where we will focus on 3 keys to leverage in order to prevent abandonment of the shopping cart process. Part 1 of a 2-part series. “Truly great search is all about turning intentions into actions, lightning fast" says Google in its AdWords blog.